Stop Press! It’s time for another frock announcement – if you don’t want to read about another in my ongoing series of dress collaborations with Heyday, look away now! 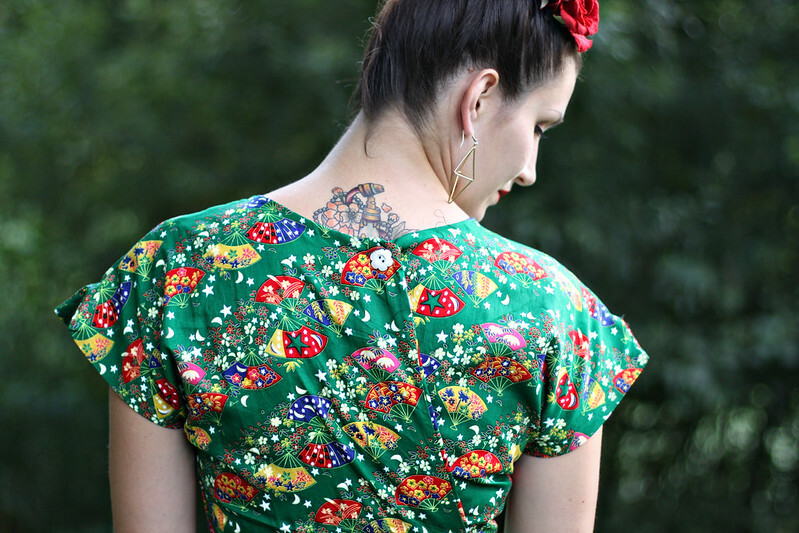 A long, long time ago… well alright, it was in about September last year, I modelled another limited edition Fleur dress in a beautiful fan print. The dress has just been released (actually just in time for Chinese New Year (ie. last week, but I am not on the ball) and so here I am telling you all about it. Now the Fan Fleur of delight has been the object of many a gal’s admiration, but as a one-off just for me, it was sadly unavailable to anyone else. But now it is… and in a colourway that I actually think I might prefer even more… what do you think? 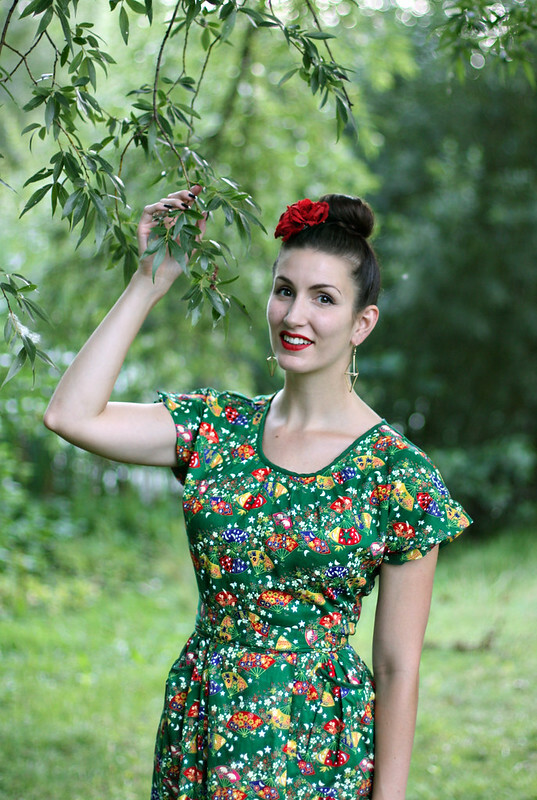 The green Heyday Fan Fleur is a picture-perfect 1940s/1950s wrap dress repro, made from polycotton this time and, before you gasp in horror at its inauthentic fabric, just ask yourself one thing. Do you enjoy ironing that much? Of course you don’t. 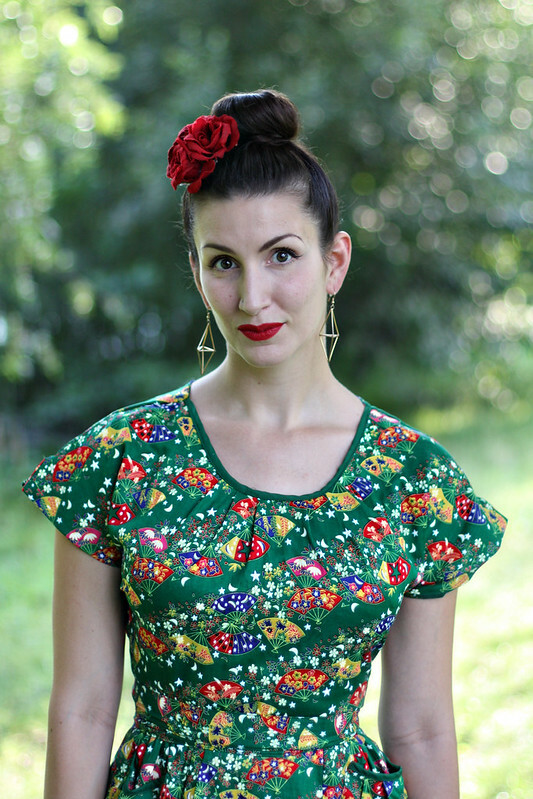 This dress is incredibly easy to iron, leaving you more time for picnicking and drinking gin cocktails out of tea cups, like all us vintage girls do all the time. I jest, of course, but it does save time and it stays looking relatively crease-free all day, and who doesn’t want that? Signature round pockets are bound in plain green, and the button on the back is a white, 60s-esque plastic number. Tattoo not included! There are only a few of these in existence and I know that a good chunk of them got snapped up already, so if you want one then you’d better nip in quick. I know I always say that, but ’tis true! It’s an ideal spring outfit in the making. Pair with Mah-Jong bracelet for added oriental chic! I wish I hadn’t lost the yellow bakelite hoops I’m wearing in the first picture – woe! Here’s a bonus picture of me with my vintage fam The Vintage Mafia in our matching Fan Fleurs in a feature we posed for recently.. but that deserves a post all of its own. Stay tuned! Thanks for reading, be sure to let me know if you get yourself one of these beauties! PS Talking of the VM, if you’re a fan of actual fans too, check out The Vintage Vanity Case on Etsy. My pal Sadie making customised hand-painted fans and they are FANtastic. Pun very much intended. All three of you are looking gorgeous. I have been looking for a vintage dress for my wife(To surprise her as she always thinks I am not of this type). I got some pretty good ideas from you ladies. you look gorgeous in both colors – beauty that you are! These type of b=vintage model dress are so famous really. Thanks for sharing the matters and pictures. Wow, the dress looks lovely and I much prefer the green! Oooh, now these are just marvelous! I love how very equal handed elegance and whimsy alike are in this terrific fabric choice.